Lego is a good buy at almost any time, and Lego City is guaranteed to give hours of fun and work. With two sons (aged 6 and 10) and a husband, there’s nothing like some new Lego for some dad-and-sons play time. We tried the Lego City Starter Set and the Lego City Cargo Truck in a Box. The Starter Set says it is for ages 5+ and the Cargo Truck in a Box is for ages 5-12. They are just two of the myriad number of sets in the Lego City series which encourages kids to think about what is needed to build a city. The emphasis is on the engineering and civil services required for a city, though, not the essential services of hospitals, schools, parks and – as my 13-year-old daughter pointed out – shopping centres. That is the first point to make about the Lego City series. While there is no reason why a girl could not play, the series and the individual pieces are more likely to appeal to the average boy than the average girl. Having said that, my three ‘boys’ had great fun with both sets. This combines a selection of all three emergency services into one set. 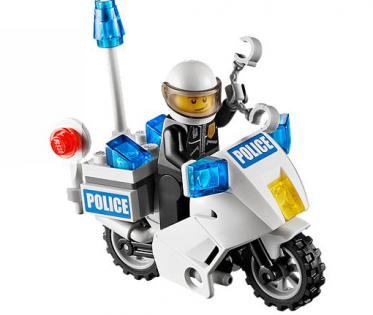 It is very generous with 272 pieces which includes a fire fighter, motorcycle policeman, ambulance attendant and two bonus characters – a child on a skateboard and, I guess to keep in with the theme, a robber with his stash of stolen goods. The figures are familiar but the accessories are new and fun. They include a medical bag and stretcher for the ambulance attendant, money, jewellery and gold bars for the robber, and a container on fire for the fire fighter. My sons said their favourite bit was the fire truck because it has doors and the ladder and roof are removable. Other than the fire truck, there wasn’t a lot to ‘play’ with in the starter set – but it is a starter set and helps give the bits and pieces needed to build the city. My 6-year-old enjoyed it more than the older one. This is a fabulous set for many reasons. It has 321 pieces and something I noticed straight away was that one of the figures is a female ‘blue collar’ worker, which is good to see. There’s the large cargo truck itself, two pallets, a forklift, four gas bottles, trolleys and the three workers. The forklift lowers up and down, the truck container opens up, there are doors on the truck and the driver can get behind the wheel ready for another delivery. There is even a coffee cup for the truck driver! This set has so much in it. It occupied my sons and husband for days and also had a lot of playability in it, which is traditionally Lego’s forte. At just under $40 each, these are good value. There’s lots of pieces and lots of variety and give plenty of hours of fun and work. Lego City is a good start for school-age children. It’s not only developing skills, and giving them something to play with, but also helping them to think about the what makes a city. It’s hard to go wrong with Lego, isn’t it? I think these are very much focussed on the boys’ market. My daughter certainly wasn’t interested and I can’t imagine many girls would be. I also think the Lego City Set is better for younger age groups (eg. 5-10 years) rather than boys pushing 12 years of age, but that will be very dependant on the individual child.